Wisdom, the world's oldest known banded bird in the wild, incubates her egg on Midway Atoll National Wildlife Refuge. 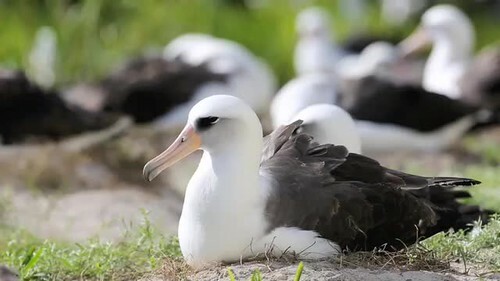 The Midway Atoll National Wildlife Refuge and Battle of Midway National Memorial is home to over three million seabirds, including the largest colony of albatross in the world. Midway Atoll is one of the most remote places in America. Culturally significant for Native Hawaiians, it has also been a place of strategic importance for communications, commercial airlines, and the military – and it has always been a home for wildlife. Today, more than ever, fish and wildlife rely on the marine and terrestrial habitat at Midway, safeguarded and maintained by the U.S. Fish and Wildlife Service as the Midway Atoll National Wildlife Refuge and Battle of Midway National Memorial and Papahānaumokuākea Marine National Monument. The Service manages Papahānaumokuākea with our partners the National Oceanic and Atmospheric Administration, the State of Hawaii and the Office of Hawaiian Affairs.